What are Solar Array Combiners? An array combiner is pretty much what it says - it takes the wires from several arrays and/or solar panels and combines them into one main bus or feed. 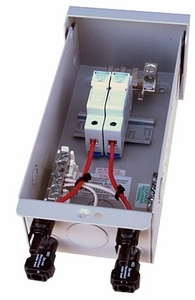 Fuses (and fuse holders) or breakers are not usually included with combiner boxes, as each setup will be different. Those must be purchased separately. An "array" may be one panel or many in series and may range from a single panel 12-volt up to multi-panel high voltage arrays for grid-tie systems. Grid tie systems can go as high as 600 volts DC, while nearly all battery systems are 12, 24, or 48 volt. Higher voltage systems over 48 volts have different NEC code requirements than those for low voltage battery systems, and the two types are NOT interchangeable. As a general rule for battery systems, an array combiner is not really needed for 1 or 2 panels, and may not be needed for 3 to 4 panel systems. If you have more than 4 panels or strings of panels to combine, we definitely recommend a combiner box. There are also two types of wiring for combiners. Most common is the standard one that has been around for years where each pair of wires from the panel junction box is connected to terminal blocks. One problem is that nearly all new panels come with MC connectors, not junction boxes. That often requires that an MC extender cable be purchased and cut in half to transition from the solar panel wiring to the array combiner junctions. Becoming more available, but still uncommon, are combiner boxes using MC connectors that simply plug in. They have simplified wiring in many cases, and the cables are available in a wide range of sizes. Unfortunately, the availability of combiner boxes specifically designed for use with MC cables is a bit sparse right now, and the chassis mount MC connectors are often difficult to find and rather expensive. Most lower voltage battery based systems up to 48 volts can use DC breakers. High voltage combiners may have voltages of up to 600 volts DC, and to meet electrical and safety codes, nearly always require fuses be used instead of breakers. This includes such products as those made by Midnite Solar, OutBack Power, and others. These are designed for higher voltage circuits often used in grid-tie applications and all meet NEC requirements. Nearly all have fuses or breakers for each circuit, and some have additional breakers, disconnects, or fuses for the combined high current bus. Most are rated at 600 volts max.